Foreign Policy of the EU – who’s in charge? Who will be the brightest point in EU Foreign Policy? The current shape of EU External Policy is existing thanks to The Lisbon Treaty, which modified Common Foreign and Security Policy (CFSP) – that’s the official name of the above mentioned external policy of the Union. The most important change was an introduction of the High Representative of the Union for Foreign Affairs and Security Policy. The procedure of appointing a person for this important position lays in the competence of the European Council’s vote, acting by qualified majority with necessary consent of the President of the European Commission. The first person to hold this office was appointed since 1 December 2009, Catherine Ashton. She will be replaced exactly this Saturday by Federica Mogherini, former Italian FM. The term of office of the High Representative is accurately the same as the European Commission, so five year term. In theory, holding this office means you are the main person to whom outside leaders should call when they want to “talk with the EU”. The position itself is not as autonomous as we may think, because it’s closely connected with EU institutions such as: the European Commission, European Council and the Council of the EU. First point is that High Representative is at the same time the Vice-President of the European Commission, second that he or she participates in European Council, and finally chairs the Foreign Affairs Council. The main task of the High Representative is to carry out and coordinate CFSP. 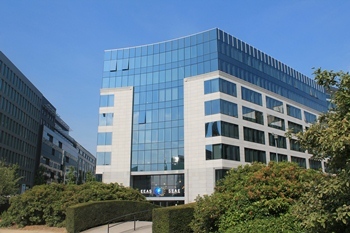 A person holding this office should exercise foreign policy on behalf of the EU, coordinate tools of EU foreign policy, building consensus between 28 EU members, represent the EU internationally, ensure coordination of EU peacekeeping operations, supervise EU Delegations or ensure the unity and effectiveness in the field of CFSP. A very significant and necessary tool to fulfill the mandate for the High Representative is the European External Action Service (EEAS), existing since 1st January 2011. If we could compare it to national conditions, it’s like one big Foreign Ministry for the whole Union. It consists of individuals delegated by its national diplomatic services, officials from the General Secretariat of the Council and the Commission. The task of this diplomatic service is to support the High Representative of the Union, in particular with regards to: monitoring the consistency of the Union’s external actions, assisting in chairing the Foreign Affairs Council and exercising the office of Vice-President of the Commission. The European External Actions service supports national diplomatic services and other EU institutions and bodies, cooperating with the European Parliament. At least twice a year the High Representative reports on foreign policy achievements and plans to the EP, also being questioned by MEP’s – the EEAS assists the High Representative with this task. At the level of Heads of States or Government, the Union is represented by the President of the European Council. For instance, on September 25, European Council President – Herman Van Rompuy represented the EU at the UN General Assembly. The case of the EU at the United Nations is valid since the European Union has been granted an enhanced observer status at the UN on 3 May 2011 – meaning it has the right to speak but not to vote. During all General Assemblies the EU can be also represented by the High Representative (it happens rather rarely) , the European Commission and EU Delegations. Another confusing fact is that the President of the European Council is conferred to represent the Union on issues related to Common Foreign and Security Policy, as it’s written in the Treaties. As a consequence, the High Representative should consult foreign policy priorities and directions with the European Council President since the role of the European Council is to define political directions and priorities. And finally, the President of the European Parliament represents the Parliament to the other EU institutions …as well as to the outside world. As you see, Common Foreign and Security Policy of the EU is too fragmented, which means too many entities takes part is the representative functions. Current state of actions could lead to unnecessary tensions between EU institutions, its Presidents and bodies and as a consequence between EU member states. Don’t you think it would be absolutely enough to have the High Representative of the Union for Foreign Affairs and Security Policy assisted by European External Action Service?